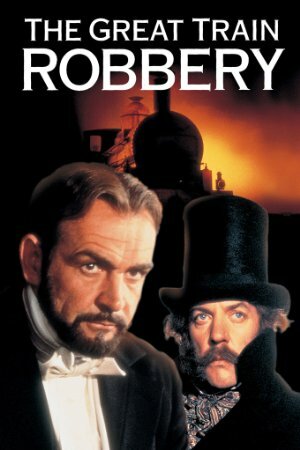 Roger Ebert: Until one Edward Pierce made off with a shipment of gold being sent to meet the British army's payroll in the Crimea, it was, quite simply, thought impossible to rob a moving train. Pierce got clean away with some 4,000 pounds. The haul is a great deal larger in Michael Crichton's "The Great Train Robbery," but he based his original novel more or less on the facts. In the process of writing and directing the movie, however, Crichton has taken more liberties with the facts, and he's inserted a vein of wry humor. That's just as well, since (a) we don't desperately need another tightly wound caper film, and (b) his cast was born to play wry humor. The leads are Sean Connery and Donald Sutherland, teamed up with Lesley-Anne Down (fondly recalled as Georgina on Upstairs, Downstairs). Connery is one of the best light comedians in the movies, and has been ever since those long-ago days when he was James Bond. The Bond movies, with their violent pyrotechnics and bizarre special effects are somehow remembered as thrillers. Not really so. They were stylish, droll comedies that were flavored with thrills, and Connery played Bond as an understated comic character. Maybe that's why George Lazenby and Roger Moore have never quite filled Connery's shoes as Bond: They played 007 too straight. Vincent Canby, NYTimes: Mr. Crichton's screenplay displays what in an earlier time might have been called a saucy wit. The major portion of the film is devoted to the adventures of Mr. Connery and his associates as they seek the four keys necessary to unlock the safes containing the gold once they get aboard the train — this being in the days before nitroglycerin or combination locks. There is a prissy plain-Jane — very sweetly played by Gabrielle Lloyd — to be romanced by Mr. Connery, a prison escape to be arranged for the one catburglar in England who can pull off one phase crucial to the operation, and a con game to be played with a gullible bank manager in a brothel. The brilliant Alan Webb appears briefly but importantly as the elderly president of a bank, the possessor of one of the all-important keys. It is Mr. Webb who has one of the film's nicest lines when, explaining why his beloved dog lost a rat-baiting contest, he says with sadness, "He lacked bustle." Bustle is what this film is full of. Variety: Crichton’s films drag in dialog bouts, but triumph when action takes over. Handling of the train sequences by cinematographer Geoffrey Unsworth is a lesson in the superior effectiveness of a well-placed camera over fancy tricks. A final caption dedicates the film to his memory, stating: ‘His friends miss him.’ So will his audiences. This is one of those fun little gems that seem to have escaped notice by most. Definitely worth a look. Thanks for the reminder to watch this. I love heist movies. I've just returned from America, a country of many prominent erections.